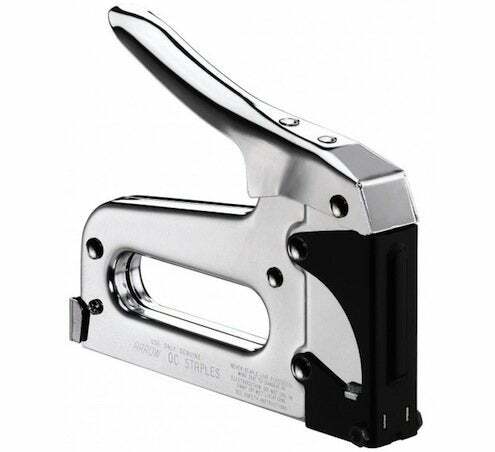 It’s a ‘staple’ in every tool and craft kit, it can save you lots of time banging tacks or nails, and it can get into some tight spots your hammer can’t: I give you the humble staple gun. The most common staple gun is the hand-powered, spring-loaded variety. Standard guns accept staples from one quarter to nine-sixteenths of an inch long. If you’re finding it hard to get staples to go in all the way manually, try changing your angle. Some guns require some serious hand strength. You might consider upgrading to a higher quality or electrically powered model if you use your staple gun a lot or you’re doing precision work. For a real time and energy saver, try a hammer stapler. The impact of the head with the surface releases the staple, so if you don’t need to be exact, you can move fast on things like housewrap, roofing paper, or even bulletin boards!